This is the seventh and final post on great performances in westerns, and this one deals only with performances by women. There are far fewer of these than there are for male actors, for at least three reasons: (1) The population of the American frontier as it developed tended to be heavily male. It was a rough place for women, and there weren’t that many of them, comparatively. 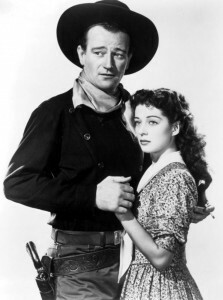 (2) Partly for the same reason, westerns have mostly featured active male roles, with females more the object that males fought over, defended or reformed for. Female roles tended to be passive. (3) When westerns were made featuring women in more prominent or active roles, they often tended not to be very good or not to do well at the box office because they didn’t meet the expectations of the usual audience for a western. 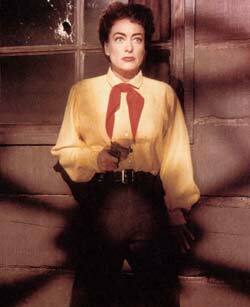 However, as one thinks back over westerns since 1939, a few female performances come to mind. If we were giving lifetime achievement awards, special honors might go to Joanne Dru (Red River, Wagon Master, She Wore a Yellow Ribbon) and Katy Jurado (High Noon, Man from Del Rio, The Badlanders), both of whom show up in several westerns. If you have suggestions about other performances that should be on the list, leave a comment. 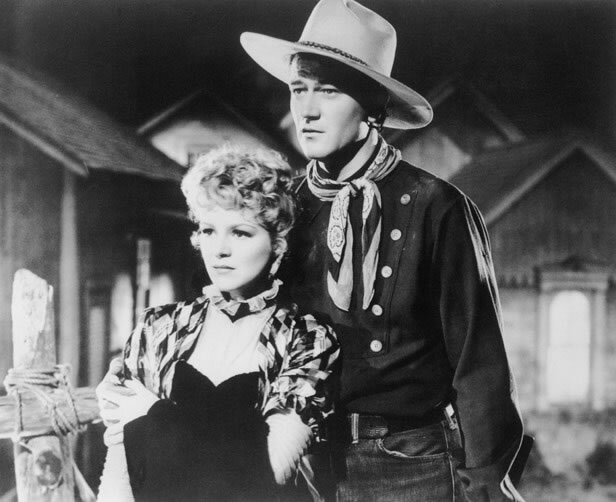 Dallas (Claire Trevor) and the Ringo Kid (John Wayne) confront their pasts in Lordsburg. 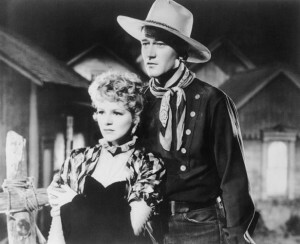 At the time Stagecoach was released in 1939, Claire Trevor was the biggest star in an ensemble film. 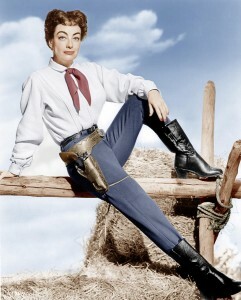 She received higher billing and was paid more than fledgling star John Wayne. She is the most memorable single figure in Stagecoach aside from Wayne. Her surprisingly sweet bad girl Dallas (how could anybody object to a prostitute/dance hall girl this nice, even in 1939?) forms a relationship with Wayne that seems doomed from the start for a variety of reasons. One of the tensions in the movie is how explicit she’s going to get with the Ringo Kid about her past, and how quickly he’ll run when she does—not that he seems like a great catch himself, given his own past. As he puts it, “I guess you can’t expect to break out of prison and into society the same week.” Trevor tended to show up in films noir in the 1940s, and her best-known role to modern audiences is in Key Largo, as Edward G. Robinson’s alcoholic moll. She’s very good in that, too, and won an Oscar as Best Supporting Actress for her performance. Trevor and Wayne were paired three more times in films, but never as memorably as in Stagecoach. James Stewart in his first western as the eponymous Destry would not have been nearly as effective without the cosmopolitan saloon girl Frenchy, played by Marlene Dietrich, to play against. She’s corrupt, she’s in cahoots with the sleazy, crooked saloon owner Kent (veteran screen heavy Brian Donlevy), she has cheated men out of their land, and she’s either testing or attracted to the apparently naïve Destry, new sheriff. So the central conflict (aside from the usual and less interesting “Will Destry get the bad guys?”) is whether this will be a real attraction and, if so, how it will work out. Ironically named (she’s obviously German, not French), she doesn’t really have much of a singing voice, but she delivers one of the most memorable musical numbers ever in a western in a cabaret style, with “See What the Boys in the Back Room Will Have.” She doesn’t back off from a fight, and she’s the catalyst for the winning strategy in the final battle. 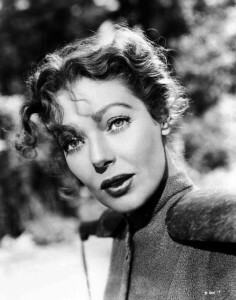 She’s the most interesting character in the film, and she played variations on this character in The Spoilers (1942) and in Fritz Lang’s Rancho Notorious (1952). In two of these three films, her characters were so morally compromised that the only way to redeem them cinematically was to have her take a bullet for somebody else. John Wayne is young-ish, handsome and charming in his first effort at both starring and producing. But it’s the luminous Gail Russell who really makes the story work as Penelope Worth, a young Quaker woman from Pennsylvania, who quickly falls in love with and reforms Wayne’s quasi-outlaw Quirt Evans. The story glosses over some not-entirely-believable points (Penny’s miraculous recovery, the marshal’s sudden unexpected appearance at the end), and the technical qualities of the sound and film aren’t what you’d hope for 1947 in many of the prints and DVD transfers now in circulation. But the movie works and it’s delightful, mostly because we believe that Evans would fall in real love with such a warm and honest (and gorgeous) religious woman. She’s good again in one of her last roles in another Wayne production, Seven Men from Now, with Randolph Scott, before her tragic early death at 36 from an alcohol-related heart attack. Loretta Young wasn’t in many westerns (this and 1945’s Along Came Jones), but when she was, she was in the center of them. Not only does the title signal that the movie’s about her character, but how interesting or convincing the movie is depends mostly on her character. 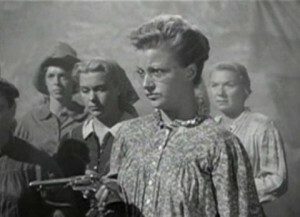 Her supposed husband, played by William Holden, is mopey for most of the film. But Rachel, as a bond servant sold to a husband she doesn’t know but goes with, is elegant and quietly reveals aspects of Rachel’s character and background as the movie goes along. One can see why both William Holden and Robert Mitchum would want her by the end of this movie set on the colonial frontier. Mitchum comes to that conclusion very quickly; it takes Holden most of the movie and an attack by hostile Shawnees to get there. She’s known mostly for her performances in films noir and gangster movies–think White Heat, with James Cagney. Here Mayo brings a noir sensibility to Raoul Walsh’s remake of his classic High Sierra, this one set in 1870s Colorado Territory (presumably before it became a state in 1876). 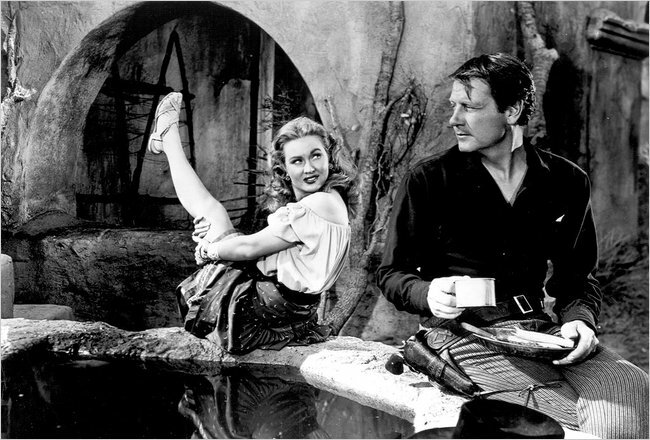 As Colorado Carson, a half-Pueblo saloon girl from El Paso, she is immediately attracted to decent outlaw Wes McQueen (Joel McCrea) although she is wanted by the sleazier members of his gang. 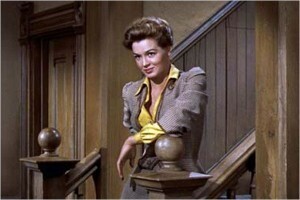 She spends most of the movie trying to persuade McQueen that she is more his kind than Dorothy Malone’s Julie Ann. By the end of the movie, we agree with her, and so does McQueen. The colorful Italian poster for the movie features her in the forefront, depicting a version of the movie’s final scene. Physically, the role of a part-Indian wouldn’t seem to fit her light coloring and eyes, and initially the dark makeup is a little distracting. But we soon forget that and believe her. Her best other performance in a western is in Fort Dobbs, with Clint Walker. 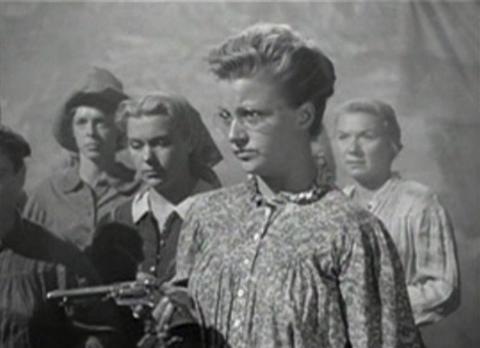 See her also in Budd Boetticher’s Westbound, with Randolph Scott, and in The Tall Stranger, with Joel McCrea. This is the story of a wagon train of women headed for California in the 1850s to find husbands. They have a variety of backstories, but they’re compelling as all this develops, led by Hope Emerson and Denise Darcel. Darcel plays a Frenchwoman of dubious background who comes to be the romantic interest of the somewhat unwilling wagonmaster Robert Taylor. Hope Emerson, at six feet two inches tall, plays a widow from a seafaring family in New Bedford, Massachusetts, who takes on many of the most difficult tasks first–and inevitably ends up with a short husband. The women are well-differentiated and seem to be generally courageous in varying ways and of authentic-seeming character. Some of that is good directing and some of it is good editing, but what we know as we watch is that there are strong and interesting characters on the screen in this underappreciated film. The DVD from Warner Brothers Archive features an interesting commentary by film historian Scott Eyman, who points out that many of the women in this film were not actresses first, but stuntwomen. This strange Nicholas Ray western with noir overtones and bright colors has become a cult favorite in some circles. Joan Crawford chews the scenery as only she knew how, as Vienna, an Arizona saloon owner at odds with neighboring cattlemen and especially with an obsessive Mercedes McCambridge, local rancher and banker. She’s constantly dealing with undefined relationships and past relationships that aren’t past, as well as lynch mobs, sympathetic outlaws and Sterling Hayden, the Johnny Guitar of the title—a conflicted and curiously passive gunman. In addition to the near-surreal direction, the climax of this movie features an all-female gunfight between Crawford and McCambridge. Crawford can easily seem overbearing in some roles, but that approach works to make Vienna interesting in this film. She’s strong, independent and doesn’t back down from bankers, mobs, gunmen or outlaws. The problem here is in finding a male in the movie to match with her. By more than one account, she did not get on well with co-stars Hayden and McCambridge or director Ray, and generally despised the movie. This film might make an interesting double feature with Rancho Notorious featuring Marlene Dietrich, a couple of entries in the movie-queens-as-cattle-queens trend of the 1950s. Maybe you’re not allowed to do that without Barbara Stanwyck in the mix somewhere. Feathers is a typically Hawksian female, assertive and inclined to be frank about what she wants. She’s a female gambler and former dance hall girl with attitude. Compare Angie Dickinson in this movie with the Lauren Bacall character in Howard Hawks’ To Have and Have Not, for example. Both of them are very young women interested in men substantially older than they who are capable but for the moment beleaguered by the situation in which they find themselves. The female dialogue sounds very similar (some screenwriters were the same), but it works–and the performances work–in both cases. Angie Dickinson puts her own twist on the dialogue and has more vulnerability than Bacall showed, once embattled Sheriff John T. Chance (John Wayne) gets past her outer shell. These two roles couldn’t be more different. Prudy Perkins is the feisty, opinionated, accident-prone daughter of the local mayor who develops a romantic relationship with new sheriff Jason McCullough (James Garner) after McCullough keeps catching her in personally embarrassing situations in the successful western comedy-satire Support Your Local Sheriff. 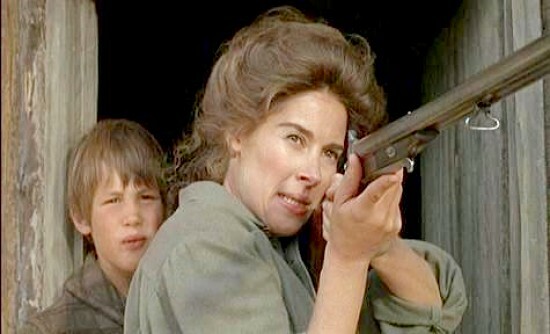 And Catherine Allen is a young widow with a son, stranded on their way to Oregon. She quietly forms a relationship with seasoned cowhand Will Penny (Charlton Heston) when the three of them are caught in a remote line cabin during the winter. The question is whether, after a lifetime of independence and with fading career prospects as the western frontier closes down, Will Penny can step up to such a relationship and its responsibilities. Hackett’s Catherine Allen makes the notion very appealing. The success of the film depends on her performance and that of Charlton Heston as Will Penny, and they are both good. (Heston could have been on the great performances list for this movie, too.) After these two successes, one would think that Hackett’s career would take off, but she went mostly into television work and died at 53. She was said to be a demanding perfectionist with strong political, environmental, social activist and other opinions who was not always easy to work with. From the evidence of these two films, she was also a very good actress. 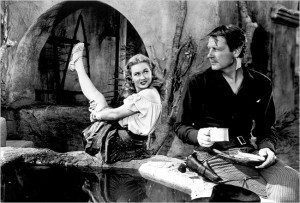 A Thousand Pieces of Gold is an atypical western in that (a) it focuses primarily on the development of a male-female relationship and (b) the principal character is a Chinese woman in the American west. It succeeds on both counts, in large part because Rosalind Chao is both convincing and interesting as Lalu/China Polly. This was a small movie that has not been available on DVD, so it is not well-known or frequently seen these days. Sold by her family in China, Polly quietly forges her own way as the center of the movie, as men with varying agendas try to take her over. She forcibly causes Hong King (David Paul Hong) to reconsider his plan to make her a prostitute in his saloon. She resists Charlie Bemis’s entreaties to stay with him because she plans to return to China. China Polly and Charlie Bemis were an historical couple in Idaho, and this is an excellent telling of their story. And it works mostly because of the depth and attractiveness of Chao in the central role. 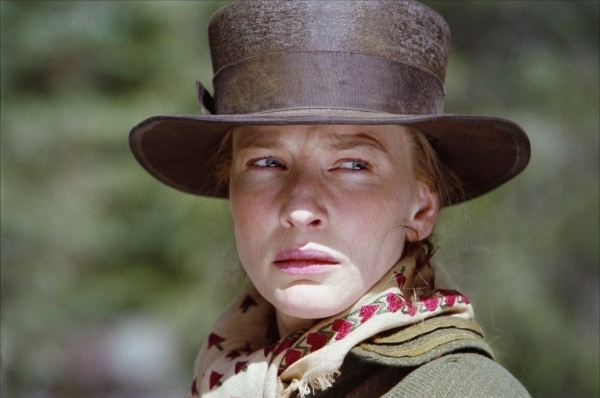 Australian actress Cate Blanchett seems to be Meryl Streep’s successor as the premier actress of her time, and this is her only western (so far). She’s very good as a local New Mexico healer, estranged daughter of Samuel Jones (Tommy Lee Jones), and mother of an abducted daughter (Evan Rachel Wood). Ostensibly, the movie’s plot is about recovering the daughter taken by renegades, but an equal part of the interest is in watching her work out and recover her relationship with her long absent father. She’s strong, independent, capable in many ways (although not as good with wilderness or Apaches as her father), and kind of a symbol of traditional Christianity against the animism her father has adopted. She fights, learns to relate to Indians herself, saves herself and her children, and is generally admirable. It’s a layered performance by an intelligent and versatile actress, and she’s well worth watching here. Jenna Wood, playing her younger daughter Dot, is also very good in this film, as is Tommy Lee Jones. 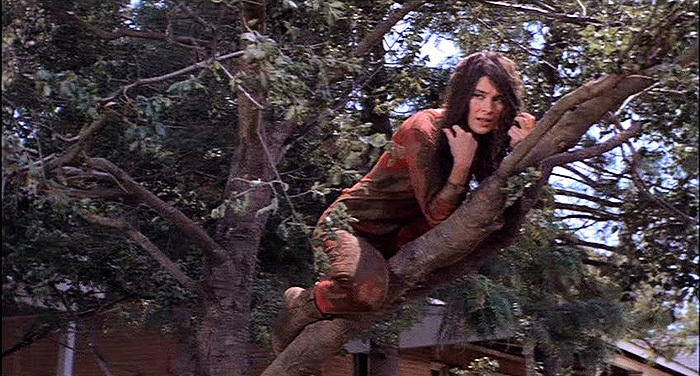 Reprising a role played by the forthright Kim Darby in 1969, Steinfeld as the 14-year-old Mattie Ross plays an Arkansas girl who hires rough marshal Rooster Cogburn to join her on a manhunt into the Indian Territory in search of her father’s killer. A third member of their party is a dandy-ish Texas Ranger, and the relationships between the three of them provide much of the interest for the film. In her first movie role, Hailee Steinfeld had to be able to show youth (that was the easy part), determination, independence and, yes, grit, and do it convincingly using period language. She could easily have become irritating if her performance was not carefully modulated. In addition, she had to hold her own with two excellent actors, Jeff Bridges and Matt Damon. She does all of that well, more persuasively than Darby did for many—and Darby wasn’t bad. Watch them both and draw your own conclusions. This entry was posted in Directors and Actors, Lists and tagged Marlene Dietrich on December 10, 2013 by Nicholas Chennault.